Vourvourou is Sithonia’s choice pick for high end accommodation. With its roots in tourism, Vourvourou is the playground for mainly the Greek and Russian creme de la creme. The Blue Lagoon is an extraordinary marvel that cannot be found anywhere else in Halkidiki. A small strait between Diaporos Island and another small island, the Blue Lagoon is a shallow bay with a white sandy sea bottom. This combination of white sand and the shallow depth allows for a very light glacier blue color to the water. From above it appears as if somebody turned on the underwater lights to illuminate the lagoon like a brilliant gem – it’s absolutely stunning! Just imagine yourself diving from the deck of a boat into the refreshing crystalline sea or snorkeling in this pool-like wonder that has some of the best visibility in the world! The Blue Lagoon is worth the effort to go to Diaporos Island. To take advantage of this phenomenon, tour companies in Sithonia have organized Blue Lagoon boat tours that will take you on day trips to the Blue Lagoon. If you want more control over your day then you might think about renting your own boat or a sea kayak. Boats and Vourvourou fit together like a hand in glove. With its nine-island archipelago, Vourvourou is a unique destination in Halkidiki. These islands group together to form a bay between them and the mainland. Protected from the open sea, the water in the bay is calm and ideal for boating. And renting a boat is the thing to do in Vourvourou, you don’t need a license. Spend the day exploring the beaches and inlets of Diaporos, the other islands, or even the mainland. Take your picnic basket along and have a romantic afternoon on your own isolated cove or island. Vourvourou is not just the place for small boats, yachts are also a common feature. Don’t be surprised to see some yachts or sailboats anchored in the bay as some of the affluent also take advantage of the treasures that Vourvourou has to offer. Karidi on the south end of the village is one of Halkidiki’s most photogenic beaches. With powdery sand that has no equal and very shallow calm water, this family paradise is very crowded in the summer but still worth it. If you can’t find a spot for your towel and umbrella on Karidi then go just a little further south to Fava beach. The locals love Fava, while the sand is not as nice and fine as Karidi the swimming is better. Livari is also a ‘one and only’ beach in its class. A narrow strip of sand that cuts the bay in half and from land it may appear that people are actually walking on water! 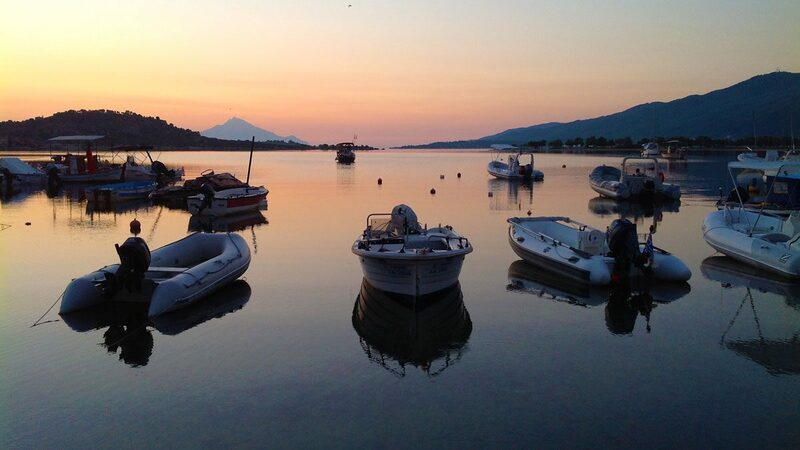 Livari also has one of Halkidiki’s most spectacular sunrises. Vourvourou deviates from the norm. While you would expect a village to have a center, Vourvourou doesn’t. There’s not a lot of restaurants or shops, Vourvourou is more of a collection of hotels and apartments, so what is there to do in Vourvourou? Those who know Vourvourou know that you don’t come here for the party, there’s no night life and there’s no bar, and there’s no noise. Vourvourou exists for those who have only one goal – to veg out. To help you to succeed with your goal, many apartments have beach front property with a small strip of sandy beach so you don’t have to walk more than you need to. Everything is right there, like a little micro-resort. Your day may go something like this… after breakfast you go from the room to the garden to the beach, then perhaps back to the room for a cold beer and then back again to the beach. This procedure you repeat day after day all to accomplish your one goal in coming to Vourvourou – to veg out and give yourself a new lease on life! If you need a little fun, speed things up with some jet skis. The calm bay is the perfect place to play. Or how about the #1 most loved Vourvourou experience? Sea kayaking! Paddle your way through the archipelago and stop of at some hidden beaches to swim or snorkel. Once you get your land legs back then you might want to think about heading up to the ridge behind Vourvourou on the mountain. There is a trail with viewpoints that will give you a birds eye view over Diaporos, truly spectacular. The same can be tried with a mountain bike for variety. Heading north from Vourvourou towards Ormos Panagias, Talgo beach has one of Halkidiki’s most famous beach bars that organizes concerts. Lagonisi beach is a popular family spot in a beautiful setting. From the Ormos Panagias harbor take a Mt. Athos cruise which is one of Halkidiki’s most favorite tours. Going south of Vourvourou you reach the beach bar zone with many beloved beaches such as Bahia beach, Rodia beach, Zografou beach and Oneirou beach, each is uniquely different and attracts a different crowd.